Interviewing to the Finish Line By Nicole Grimes, M. Ed. Whether you are interviewing for your next job or planning to meet a key business connection, planning ahead will always add value to your journey to the finish line – securing the opportunity. It starts by thinking about an interview as a process, and not a one-time event. While we all are familiar when it comes to going to an interview, it is imperative that we are truly intentional when entering a competitive atmosphere. Quite often, you have less than 30 minutes to make a lasting impression…What you do before, during, and after the interview could determine your next level on your corporate/career ladder. Prepare copies of your resume & cover letter, and bring multiple copies to the interview. Plan to arrive at least 15 minutes early. This means that you need to GPS the location, in advance and estimate time for any traffic you might encounter. Do your research – Know what you are walking into, and be able to refer to important facts about the company during your conversation. Electronics Off – leave your phone on silent or leave it in your car. Dress for success – Regardless of the position you are interviewing for, you want to show that you mean business. A well-fitted black or navy suit with conservative shoes sets a polished tone while making a powerful statement. Come prepared to share – After conducting your research about the company/organization, come prepared to share how you can help to support the mission and vision through your body of work. Reflect upon your prior experiences that would contribute to making the company or organization a success. Take notes and Take Your Time – Bring a notepad and a pen to take notes during the interview, jot down thoughts, and to stay focused on questions being asked. Keep your thoughts organized throughout the conversation by trying not to keep everything in your head. Prepare Questions in Advance – In that same notepad, prepare 3 – 4 key questions to ask the interviewer/contact about the company. Don’t waste their time or yours by trying to come up with questions out of thin air. Be prepared. One key question should be about your next steps. Follow-Up, Follow-Up, Follow-Up – Send a thank you within 24 hours of the actual interview. In this message, revisit the key points of your elevator pitch to remind the interviewer of why you would add value to the company/organization. Take time to reflect – Jot down your strengths, and areas you need to personally work on following the interview. Use those thoughts to fuel your next interview, and to strengthen your personal toolbox. Implement these key strategies to create your path to navigate your journey to the finish line. Remember, everyone’s journey is different so be intentional on your way to the top!! How much education do you really need to do your job well? Do you believe it is more important to either receive knowledge or apply knowledge? Is knowledge truly powerful? These are some of the questions that ran through my mind as I contemplated purchasing yet another course that promised to make me a 6-7 figure super awesome business maven and read yet another book on living my best life. I have 3 degrees and more certificates than I can count, but I question whether my life actually correlates with all that knowledge I have received. Then it hit me. I am a knowledge hoarder! In this article, a knowledge hoarder is defined as someone who is on a perpetual treadmill of collecting information before taking significant action to utilize the collected information. I am a collector of knowledge but share and apply only a very small portion of it. If I am truly honest I only apply the part of my knowledge that tends to allow me to stay in my comfort zone. For example, I understand the basics of marketing very well and know that I need to be consistent with whatever strategy I use. But I still tend to say to myself, "Oh I don't want to be a pest to people". "If I just send out an email once a month or shoot out a few tweets here and there, they will still remember my business, because I am respecting their inbox and am so genuine." Everyone with any sort of business sense knows that is a strategy for failure, but somehow, I try to blame my failed marketing strategy on a lack of knowledge and seek out yet another course on marketing. Once I was able, to be honest with myself and admitted that I am a knowledge hoarder, I had to face a hard truth. I was using my knowledge seeking as a tool to procrastinate on doing the necessary things that needed to be done in my business or life. Then I had to face the harder truth that I had not done some of the necessary inner work prior to taking the leap into entrepreneurship. The reality is that I have been procrastinating and hoarding knowledge because I do not truly feel worthy enough to request payment for my skill set or even just consistently sharing my knowledge. I keep telling myself if I just get this certificate or that certificate I will finally have all that I need to really advertise my business and charge what I am worth. Well, finally I am saying enough is enough! No more hoarding! Now it’s all about applying what I already know. The dress rehearsal is over. Will you join me? For the next six weeks, let's really stand in our power. Use the hashtag #LovingMeFirst so we can interact with each other while on this journey. 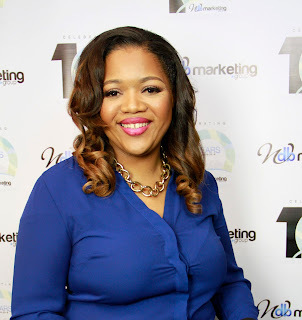 BOSS Spotlight: Keeana Barber "The Marketing Visionary"
As the CEO of WDB Marketing, Keeana Barber, focuses her day on expanding the impact her company has on small businesses. At the core, WDB is a branding and printing company, a place over 1,000 businesses proudly call their marketing headquarters. However, the imprint Keeana would like to have is much larger. Our focus as a company is more than delivering a service, more than printing — it is to truly help businesses build a foundation for success. 1. What were some obstacles that you faced in the beginning process of starting your business or career?The biggest obstacle I faced at the beginning of starting my business was a lack of a business network/mentorship. I started my business fueled by the passion to continue my brother’s legacy, who had recently passed away. Without any investment or support I hosted an event in his honor, months within his passing. The event was surprisingly successful but from there I had a string of hit or miss events as I learned from the ‘school of hard knocks’ about business. Although I have no regrets I realize that it took years to learn what I could have possibly gotten from the right mentor within months. Although I had a vision and drive for success I was not following a business model with a strategic plan. After a few years of hosting events I finally found my niche and transitioned to a full-service marketing/design firm. Although I always knew I wanted to be an entrepreneur I was unsure of the exact path. My brother, Bobby Barber, passed away in November 2004, directing me to the field I am in now. Before passing, he started a promotional and entertainment company in California called What’s Da Bizniz. I decided to keep it going in his honor. We started out as an event entertainment/promotional company and over the years have transitioned into a full-service marketing and printing firm. Work-Life balance is challenging as an entrepreneur. It feels like there is always more work to do and you feel guilty when you take time off. However, I discovered that those breaks that feel like indulgence are truly necessary to bring out the best in you – personally and professionally. I schedule my personal time in and although it is a challenge, I do my best not to flake on myself! My business coach once asked me, what do you do to reward yourself? There will always be another milestone to reach, another item on your to do list, but to be our best self we must take the time to reward and enjoy ourselves along with the way. My mom has been my biggest support system; she has worked in the business with me since day one. My mentor, Dr. Jeffrey Sterling has been integral. He runs an organization with over 500 physicians, consults internationally, is the President of a 5,000-member organization but still has time in his day for golf. I am learning efficiency from him. My must-haves for business is an updated ‘To-Do’ list. I rewrite my to-do list at least 2x a day, just to stay focused and organized. My second must have is integrity. You can make mistakes, no one will ever be perfect in business, but it is how you handle those mistakes and challenges that defines your business culture. BOSS is someone who has a vision and can clearly articulate and execute that vision without having to do everything. I learned a long time ago – if your business cannot run without you, you work for yourself. If you can leave and it keeps running, you are a BOSS. 8. Provide us with two words that describe you? Ex. "Success Coach"